Add yeast and sugar into lukewarm water. Leave for 5 minutes; stir to dissolve. Mix flour and the rest of the ingredients in a large bowl. Make a well in center and pour in dissolved yeast. Knead and the dough will be sticky. Turn dough out onto lightly floured surface. Knead dough until smooth and elastic, about 8-10 minutes. Put dough in a clean bowl and cover with a towel or cloth. Let rise for 1-2 hours in a warm place. Punch down and grease two 8 x 4 x 2 1/2 inch loaf pans. 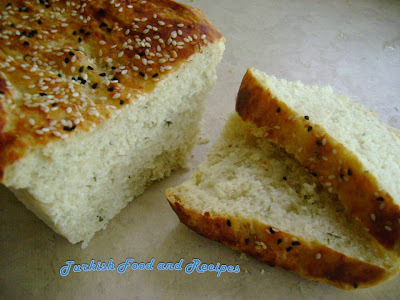 Divide the dough in two equal pieces and shape dough into a long loaf (see the picture). You will have two loaves of bread. Place shaped dough in greased loaf pan. Cover with towel/cloth. Leave for a rest until dough is 1 inch above the top of pan, about 1 hour(see the picture). 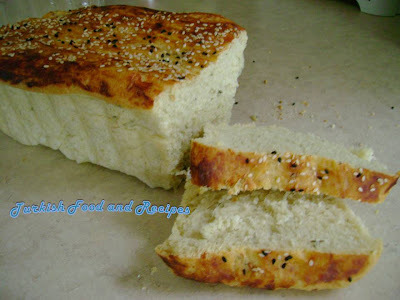 Brush top of loaf with egg glaze and sprinkle sesame and nigella seeds. Bake in preheated 400F (200 C) oven for 40-45 minutes until golden. After taking the bread out of the oven cover it with a towel/cloth to keep it soft and warm.Serve warm and enjoy Herb Battered Bread with butter or cream cheese. Bir kasede ilik su, seker ve mayayi karistirin. Mayanin cozunmesi icin 5 dakika bekletin. Genis bir kasede un ve geri kalan malzemeleri karistirin, ortasina bir cukur acin. Cukura cozunen maya karisimini dokun. Hepsini karistirip yapiskan bir hamur elde edin. Hamuru unlanmis bir yuzeye alin ve puruzsuz ve elastik bir hamur elde edene dek yaklasik 8-10 dakika yogurun. Hamuru temiz bir kaseye alin ve uzerini temiz bir havlu/bez ile ortun. Bir-iki saat boyunca kabarmasi icin ilik bir ortamda bekletin. Daha sonra havasini cikarmak icin nazikce bastirin.20x10x6 cm’lik iki tane dikdortgen kalibi yaglayin. Hamuru iki esit parcaya bolun ve her ikisine de uzun bir ekmek sekli verin (resime bakiniz). Yaglanmis kaliba yerlestirin ve uzerini havlu/bez ile ortun. Hamur kalibin uzerinden yaklasik 2 ½ cm kadar yukselene dek, yaklasik 1 saat bekletin (resime bakiniz). Uzerine yumurtali sut karisimini surun ve susamla corek otu serpin. Onceden isitilmis 200 C (400 F) firinda 40-45 dakika uzeri kizarana dek pisirin. Ekmegin yumusak ve sicak kalmasi icin; firindan cikarinca, uzerini havlu/bez ile ortun. Baharatli Ekmek sicacikken, tereyagi ve krem peynir ile tadini cikarin.